A Dream come True - Ireland Honeymoon! We would not plan a trip without Meghan!! 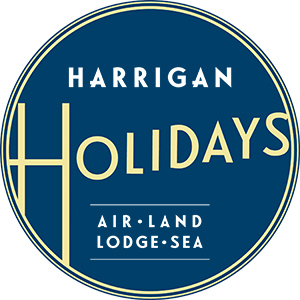 Harrigan Holidays put together two custom-themed garden tours to Ireland that I hosted in June of 2010 and 2011. Both went extremely well. All of the details (hotels, flights, meals, baggage-handling, etc.) went very smoothly. Kathy's knowledge of Ireland also helped tremendously in coming up with a nice mix of some of the island's best gardens in addition to gorgeous scenery, historical sites, cultural attractions and traditional Irish crafts. Both trips offered a good variety for everyone -- including non-gardening spouses who weren't sure they were going to like a "garden vacation." The famous attractions such as the Cliffs of Moher and the Giant's Causeway were obvious hits, but our groups also seemed to like spontaneous roadside photo stops and a visit to an Irish dairy farm just as much. Unforgettable Ireland - We had a great trip and great weather - no rain! Arrived in Dublin early. There were ten people on the tour for the first three days - four Canadians (one couple, plus one woman and her mother), a family of four from Denmark (husband wife, and two adult daughters), plus us. The Danes left us Saturday morning in Limerick to continue with the shorter tour, so there were just six of us for the rest of the time. The size of the group was nice because the bus was smaller and could stop for photo ops at places a larger bus could not stop. It also made for a more intimate group - we all ate together every evening. Seamus, the driver/guide was very good. He had an incredible amount of knowledge about the history of Ireland, plus he shared with us much of his own history as well. He was quite the guy (and he did enjoy talking about sports!). Everyone enjoyed him. We thought the tour was a good balance of city, town, and rural. It gave us a sense of the country and its people. Ken and I did get to the Beattie museum our first afternoon in Dublin, and we enjoyed it very much. In 2009, we traveled with them to Ireland. We did a wonderful ten day vacation, traveling counter-clockwise around the entire countries of Northern Ireland and Ireland. It was a great experience with lovely accommodations and interesting tours (yes, we kissed the Blarney stone). Then in 2011, we were looking to take a family vacation to Jamaica which my daughter chose for her destination wedding on the beach. 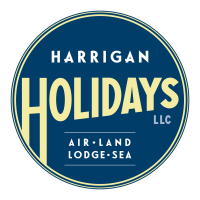 Again we selected Harrigan Holidays as our travel agent. It was a wonderful trip and we’d go back to the same resort if we ever get the opportunity.